You're going on a journey to a strange new country where you will look different, act different, even feel different. It's like you're becoming a whole new person, and that person is your mother. Your new homeland is middle age, and you need a native guide to teach you how to survive here, or least to show you where the good bars are. Written for every woman who knows that turning 40 is no reason to become respectable, Kissing the Crisis is the field guide you need to blaze your own unconventional trail through the jungle of middle age. Humorist Kara Martinez Bachman reports from the front lines of the battle to stay awake after 9 p.m., and her adventures will make you scream with laughter, cringe with embarrassment, and vow to tackle your own midlife crisis with a can-do attitude and a tasty cocktail. Whether she's searching for a child-friendly bar for a parents drinking session, starting the world s best ukulele/harp gothic rock band, coping with a baby cursing like a sailor in the grocery store, or conquering her fear of a terrifying death during Hurricane Katrina, Bachman shows that life doesn't end at 40 ... it just gets weirder. 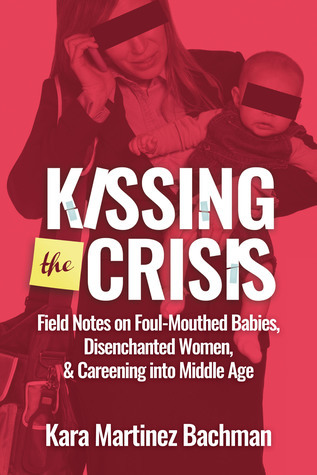 Kissing the Crisis is a hilarious look at middle age for women. It's a collection of 21 essays about how women's attitudes toward life, husbands, and children start to change after they reach to big 4-0. The subjects range from "How I turned Down a Date with Brad Pitt" and "Screwed by the Warranty" to "An Eternal Sunshine of the Midlife Mind". As someone who has passed that milestone, I found the essays full of laugh out loud humor and serious reflections that made me think about my own life. Whether your midlife crisis is coming in the near future or is in your rear view mirror, I think you should read this book for some good laughs and instructions on how to best handle your new life. "There are many upsides to midlife crisis, believe it or not. One of them is that you may begin to see things through a different prism, which patiently waits for you on the other side of the hill. "